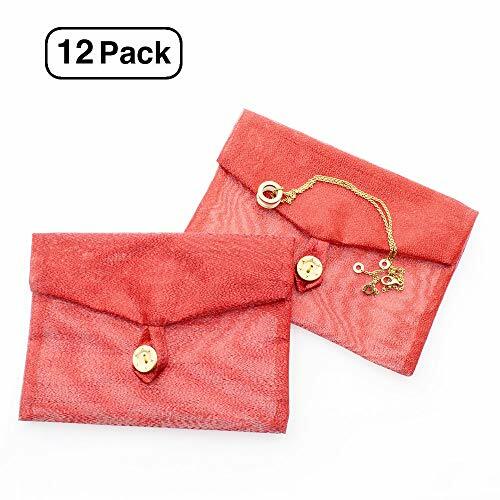 These high quality mesh favor envelop bags are perfect for a variety of uses. Reusable and affordable, these bags are great for your DIY homemade projects, crafts, and ideas. and any other ideas that you may have! We promise that you'll love these envelopes! HIGH QUALITY - These beautiful organza mesh bags and envelopes are made with high quality consistency. Each envelope has a flap with an elegant button for close. DETAILS - gift envelopes measure 4-1/3" inches x 6-1/8" inches. Each envelope is made with organza with a wood button and work perfectly for invitations. ALL OCCASIONS - These envelopes are great as jewelry bags and pouches and are also great for all sorts of gifts. Use them as Chinese Lunar New Year Envelopes for red packets, for EID cards, Baptism gifts, return gifts, wedding gifts, party favor bags, or Christmas envelopes. These sachet envelopes are also great for holding cash. MULTIPURPOSE - Use these envelopes as unique favor bags. They're small, cute, colorful, tiny, decorative and just the perfect touch for something truly pretty and special. They're great for holding gift cards and money. These are perfect as money envelopes for cash. Your Amazon gift cards would be a perfect valentines gift in these envelopes. 100% GUARANTEE - We are confident that you will be happy with our bags. If you are unsatisfied for any reason we have our 100% money back guarantee. If you have any questions about this product by Line and Bags, contact us by completing and submitting the form below. If you are looking for a specif part number, please include it with your message.